MyLifeUNIT Garden Water Wand offers 9 spray patterns for a variety of watering needs. Its long length makes this 16 Inch wand great for watering hanging baskets and hard-to-reach areas. Spray patterns for this watering wand include center, cone, fan, shower, angle, flat, flood, mist and jet watering. 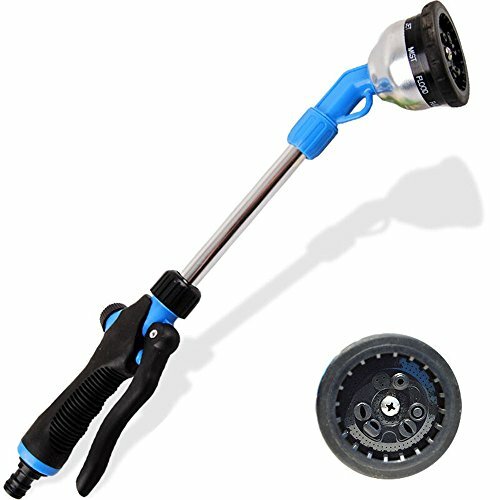 With those nine spray patterns, this water wand is fully adjustable to fit all of your watering needs. Front Trigger design with flow control lever allows for maximum watering control. Water inlet connects 16.5 mm garden hose. Strong enough to power through a tough cleaning job or wash your car but gentle enough to wash your dog or other pets. If you have any questions about this product by MyLifeUNIT, contact us by completing and submitting the form below. If you are looking for a specif part number, please include it with your message.